Cellulose Insulation is treated with fire retardants to meet all federal, state, and local fire safety requirements. 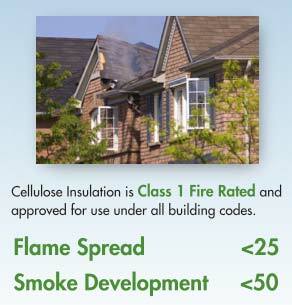 With a flame spread of 25 or less, cellulose has a Class 1 Fire rating. Walls with cellulose insulation are one-hour (or greater) fire walls and can help control the spread of fire. It also has a very low smoke development index level. When properly installed, cellulose insulation can help reduce the spread of flames in house and building fires. Some cellulose insulation manufacturers have even qualified two- and three-hour firewall designs using Cellulose Insulation. See all the Fire Test Videos on our video channel where we compare fire control in buildings insulated with both cellulose and fiberglass insulatons.